The Chronicles of Pendragon Hold: Thwarted! This entry was posted on Friday, April 17, 2009 at Friday, April 17, 2009 . You can follow any responses to this entry through the comments feed . My dogs and you goats. They managed to get through palisade stell fencing for crying to Anubis! I've just added cucumbers to our tomato-pepper-garlic-rocket-beet and basil garden. Got some ecinacea in the seedling trays, too. Wish I could have livestock.But. Dogs.Sigh. I suppose I'd rather have the companions which I can't eat, but all the same...blessings on all at Pendragon hold, including the goats, and here's hoping THE wife feels better soon. Speaking of rednecks, we had to follow a truck from our home to the grocery store belching out great plumes of thick black smoke. I'd have punched him in the face if I could. Even the 18 wheelers don't spew so much smoke into the sky. My yard is full of clover and tiny purple flowers right now. I look down the street and realize our yard is the only one that has been blessed in this way. I comment on that to my husband and he says "that's because they're weeds." Hrmph! Some people just don't know a blessing when they're looking right at it! 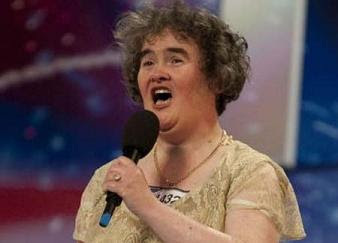 Susan Boyle is incredible! I cry whenever I listen to her sing. A pure voice and a seemingly sweeter spirit I don't think I've ever witnessed. Glad things are mostly well at the Hold. Sorry to hear that THE wife's neck and shoulder are acting up again though. I love you too, man, and friends don't let friends rant. Keep the good news coming! By the way, have you seen the movie? The movie "I Love You, Man".